This satisfying, feel-good meal takes very little effort. Serve after a long day when you want a bit of cozy comfort on your plate. Make the spice blend: Stir the ingredients together in a small bowl and set aside. Make the sauce: Lightly coat a Dutch oven with nonstick cooking spray. Add the oil and warm over medium-high heat. Add the onion, bell pepper, and mushrooms. Cook, stirring frequently, until the onion is clear and the pepper is soft, about 4 minutes. Add the garlic spice blend, and cook for 2 minutes, stirring constantly. Add the tomatoes, broth, wine, and bay leaves. Stir well and bring to a simmer, stirring frequently. Add the chicken, turn the heat to medium-low, and simmer, covered, until the mixture thickens and is heated through, about 15 minutes. Stir occasionally. Remove the bay leaves. Spoon the sauce over the spaghetti, place the chicken pieces on top, and serve immediately. 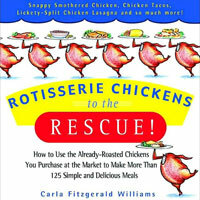 Recipe courtesy of Rotisserie Chickens to the Rescue by Carla Fitzgerald Williams. Copyright © 2003 Carla Fitzgerald Williams. All Rights Reserved. Published by Hyperion. Available wherever books are sold.